There are only a few days left until December 25th arrives and a few more days that you can donate to a Menu for Hope. If you’re still scrambling around to find presents, why not consider giving gifts that give back? We know that not everyone is a blogger, and not everyone is online and not everyone has heard of the Menu For Hope. But that doesn’t meant that you can’t give the gift of the Menu for Hope to everyone you know! Don’t forget my two bid items: EU01 Made in Italy Chocolate Basket (2+ kilos of Italian chocolate!) and EU38: Moleskine notebooks Mega Mix! 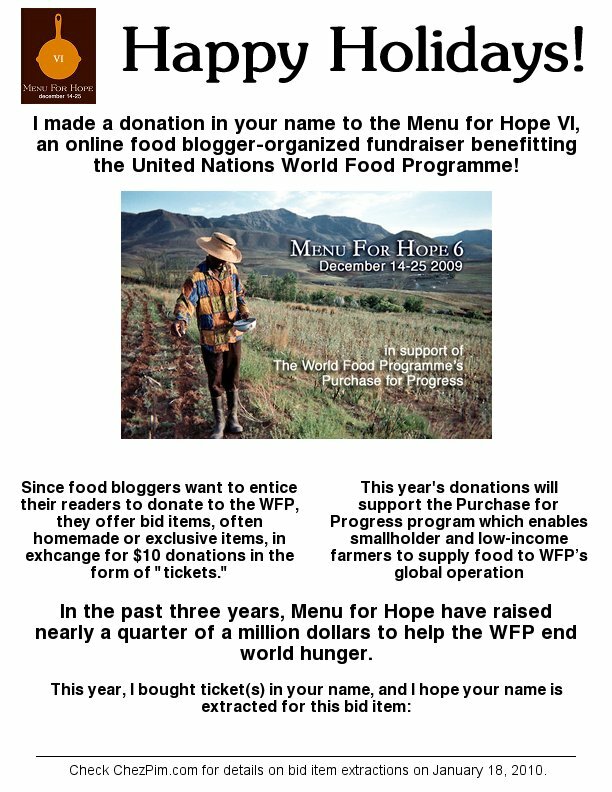 I’ve updated the “Menu for Hope Gift Card Insert” – something you can print out yourself after you make a donation to Menu For Hope that then you can give to friends/family/loved ones to help them understand this great cause and get them excited about the donation you made in their name! Check out the master bid item list on Chez Pim and use the really handy donation form (SO easy!) to pick the items you’d like to donate money for. Make the donation to Menu for Hope via Firstgiving.com (the easy donation form above will also take you to FirstGiving) in the name of your friend/family/loved one/colleague, indicating the bid item(s) as instructed on Chez Pim and/or the donation form. Send that person an email explaining you’ve donated in their name and attach the following image or PDF, or print it out and slip it inside a gift card! You’re done! You’ll be done with your holiday shopping in about 3 minutes flat! The file is approximately sized 8.5×11″ and has space to list which bid item(s) you’ve donated for, and a reminder to check ChezPim.com on January 18 to see if their name has been extracted for that bid item! Note: You MUST donate via the Firstgiving.com website in order to make a donation to the Menu for Hope fundraiser. These gift card inserts are in no way representative of a donation to the Menu for Hope and do not serve as receipts or as a proof of donation.